How odd that my grandmother’s name was Mary Leticia Grove, and that some of the documents list her family name as “Groves.” When I asked my mother why the difference, she just shrugged. Irma Miller writes that when Henri brought Emilie Chatillon to St. Louis to marry Ben Lessert that folks had difficulty understanding her mash-up of Sioux, French and English. Her name was misunderstood as “Chouteau,” a prominent family in the Midwest. So Irma grew up thinking her relatives were the Chouteaus, when, in fact, they were the Chatillon family. Irma met several dead-ends because she could find nothing about Emilie Chouteau when she began hunting down family clues. She finally figured out that the Chouteau name was perhaps a misspelling of Chatillon, after she learned Emilie had told her family about her father’s scouting trips to Oregon and that her mother was an Oglala who died when Emilie was little. Since Francis Parkman wrote much about Chatillon, Irma followed that lead. She was looking for a connection between her family name (Lessert) and the Chatillons, not the Chouteau family. As it turned out, the Lesserts actually worked for the Chouteaus, making the hunt even more difficult. When Irma checked the St. Louis marriage volume she found that Emilie Chatillon married Benjamin LaPort in 1859. That seemed like another dead end. Irma was looking for Lessert, not LaPort. Even more confusing was that Ben’s birth name was actually Louis Benjamin Lessert but most documents listed him as just Benjamin Lessert (or, in this case, LaPort). Irma did more digging and found church records recorded the marriage of Emilie Chatillon to Benjamin Lessert in 1859, son of Clement Lessert and Julia Roy. Finally she had the records that linked Chatillon with her family. Odd spellings must comprise a boatload of history and may help explain why fact and lore merge. An Osage Chief came to be known as “Claremore” because folks confused his name, which sounded like the French for clear mountain, or, mont clair…which became clair-mont. The trading post became known as Claremore. That Oklahoma town today is known not so much for an Osage chief as much as the birthplace of Will Rogers and the setting for the musical Oklahoma. And the label “Osage” took hold even though it sounds nothing like Wah-Zhe-Zhe. But the French wrote our tribe’s name the way it sounded to them: Oi (for Wah), Sa (for Zha) and Ge (for Zhe). 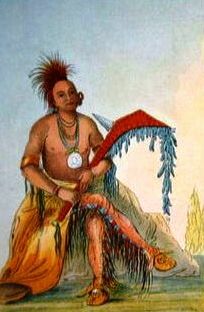 Hence: Osage. This entry was posted in authenticity, film, framing, Henri Chatillion, Indian, Osage and tagged Indigenous Science, literacy. Bookmark the permalink. When looking at the documents on Louis Benjamin andd Emilie not that Lessert is spelled with looking like a p.
The double “s” was written as sp or sf. The second s was both above and below the line. Very confusing for us moderns. Ben Lessert had several “sobriquets” We call them alias.